Depth chart: Not too much to report in this area since we didn’t see any live snaps on Wednesday. The offensive line remained in tact in individual drills with the starting five of Jacob Gilliam, Marcus Jackson, Mack Crowder, Jashon Robertson and Kyler Kerbyson still up front. At least in individual drills, Nathan Peterman was taking the No. 2 reps with the quarterbacks. Eight receivers – Marquez North, Von Pearson, Pig Howard, Josh Malone, Vic Wharton, Jason Croom, Josh Smith and Ryan Jenkins – are practicing without scout-team jerseys on. So if you’re looking for an idea of what a rotation might look like against Utah State, those guys have the best chance to play. Special teams work: After being praised by Butch Jones on Tuesday, Cam Sutton did drop one punt return opportunity in individual drills. In his defense, it was one of the drills where the returners have to hold tennis balls while make the catch, but, still, not what the coaches want to see on game week from their starter. We saw a couple different combinations at kickoff returner. Devrin Young and Justus Pickett worked with the first group and Evan Berry and Malik Foreman worked with the second group. The depth chart lists Young and Berry as the starters, so possibly they were just giving them both a chance to return one during drills. That’ll be something to watch for on Sunday. Though it wasn’t live tackling, Berry had a nice return on a ball that went to his right, but he returned down the left sideline for what would’ve been a nice play. Quarterback work: The quarterbacks had a pretty good overall day in terms of accuracy with a few notable exceptions. Justin Worley had some misses – misfiring on one to Marquez North and throwing another one low to Von Pearson that Pearson was able to scoop up for a nice grab. Worley also misfired in a drill where he was throwing at a slow-moving screen (3:41 mark of our practice video), airmailed the screen altogether and hitting a manager standing behind it. Injury notes: RB Derrell Scott, TE Woody Quinn and WR Johnathon Johnson all did not participate. • The entire wide receivers group was instructed to yell “CTT!” at Malone every time he caught the ball in practice. That’s an acronym that stands for catch, tuck and turn, which is a fundamental reminder for the WRs. • Back-up quarterback Mike Wegzyn was wearing a No. 16 scout team jersey to simulate Utah State QB Chuckie Keeton. 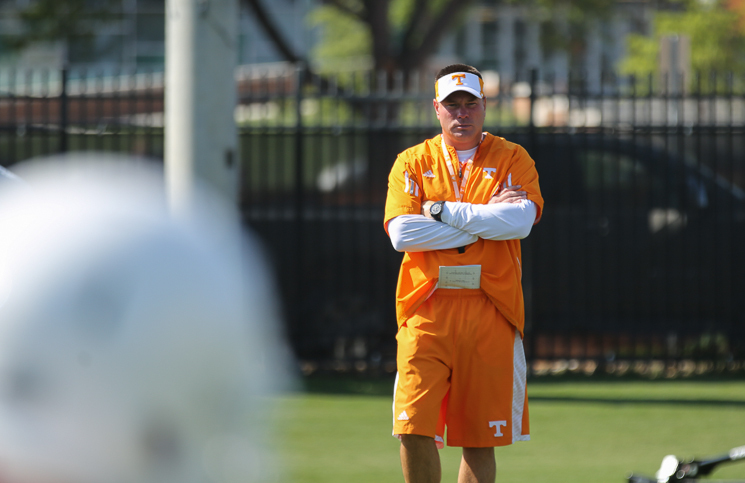 Butch Jones said they will use multiple players to simulate the Heisman contender this week. • Running back Jayson Sparks of Loganville, Ga., has joined the team as a walk-on. The defense really didn’t do much outside of drill work during the three periods of practice we were able to see today. The focus for them was on maintaining and improving fundamental technique as the Vols prepare to face Chucky Keeton and a very explosive Utah State offense. Eye discipline was a key focus for both the linebackers and the defensive backs as the coaches were really harping on the “see a little, see a lot” mantra to the players when discussing USU’s scheme. Tommy Thigpen was warning his linebackers to read their cues and not get caught peeking into the backfield watching Keeton. Curt Maggitt was full-go on Wednesday and looked to have zero lingering effects from his rolled ankle he suffered a few weeks ago. Cam Sutton drew excessive praise from defensive backs coach Willie Martinez for his effort and “perfect technique” during drill work and coverage calls. Sutton has had a quiet but extremely solid camp at cornerback and looks poised to build on his outstanding freshman season from a year ago. Todd Kelly Jr. continues his hard charge for increased playing time at the strong safety spot opposite Brian Randolph. Kelly has the speed and tackling ability to play right away and will only get better as he learns the intricacies of the position. Kelly looked extremely fluid today during the work the safeties went through and appears to be grasping the scheme better and better each day. Calls and drills that confused the freshman early in camp are now completed with ease. I think it’s safe to say that it’s just a matter of time for Kelly. Scout team: It doesn’t really pertain to Tennessee’s defensive scheme but Rashaan Gaulden is playing the role of former Vol Daniel Grey on Tennessee’s defensive scout team. Freshman Gavin Bryant drew the role of Aggie linebacker Nick Vigil, and Kenny Bynum is tasked with imitating First Team All Mountain West linebacker Kyler Fackrell. Injuries: The only notable absence from today’s practice was Travarris Saulsberry. Saulsberry was seen on the sideline at practice with a knee brace on but no crutches. Otherwise, this team looks to be in very good shape health-wise heading into the season opener.